Laura, a Pennsylvania native, migrated south for college and then to the Tri-Cities where she and her husband have lived for enough years to consider themselves Tennesseans. Since moving to the area she has taught elementary school, raise four children and been active in her local church. 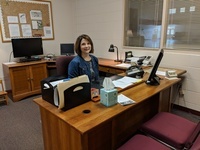 She came to Colonial Heights UMC in 2014 as the Administrative Assistant. In her spare time she enjoys playing piano and spending time with family and friends.